A pirate I was meant to be.. etc. But alas, this is not The Curse of Monkey Island and I’m not Guybrush Threepwood. In this 2D platforming title, you’re on a quest to take back a golden top hat that was stolen from you. Simple enough, and with lots of coins/gems to collect, bad guys to shoot and traps/pits to avoid, what more could you possibly want from a 2D platformer? Quality visuals? 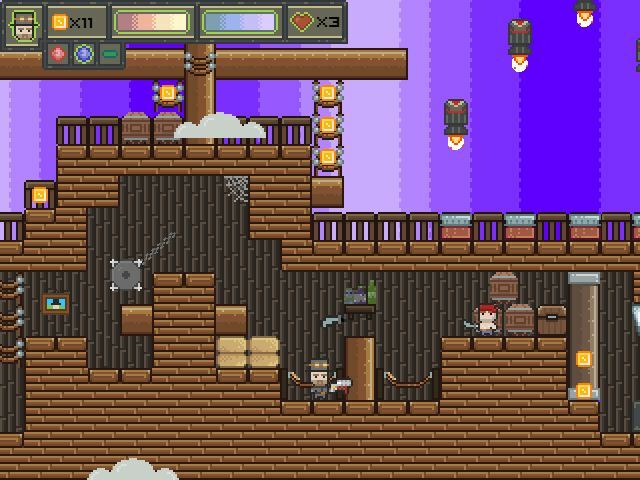 A pirate ship and a gun that shoots platforms? You’re in luck then, because Top Hat has all that and more! No, really. It has this gun that.. oh just watch the trailer, would ya? Then perhaps you’ll think me less mad.. and should you feel like trying the beta version, it can be downloaded from the game’s IndieDB page.